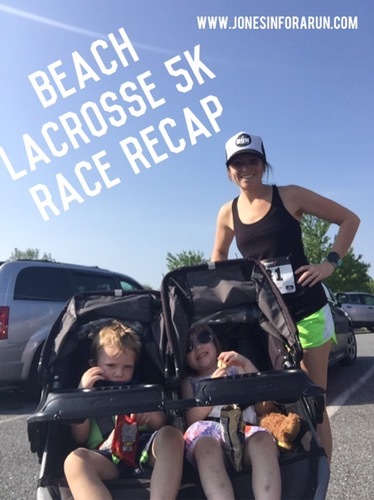 To kick off Memorial Day Weekend the littles and I headed over to “America’s Coolest Small Town” aka Berlin, Maryland to run the Inaugural Beach Lacrosse 5k! The kids were again excited to be going to run in race and I was hopeful they would be as awesome and well behaved as they were during the eRace the Stigma 5k that we ran in a few weeks ago. We arrived about 20 minutes before the race and went over to grab our bib and shirt. The race started at the local sports complex which provided a pavilion for the packet pick up, bathrooms and a playground. After doing all the pre-race things we needed to do it was time to line up to start the race! There was around 120 people there and we had an absolutely beautiful day for a run! The race started at 9:00 so as the race was about to begin it did start to get pretty warm. The race course was perfect as it ran us through the side streets of Berlin and eventually back to the starting area. As you can see from my splits my first mile was pretty amazing, especially for pushing the stroller with kids. After that first mile the kids got a little crazy and things starting flying- literally. Shoes, water cups, Benjamin the Bear (the stuffed animal we took home for the weekend from pre-school), and what ever else they could find to throw out. They started requesting specific songs and I literally thought I would never finish this race. Once we finally did get back near the starting area to actually finish the race we had to run about 20-30 yards through grass. While running this was not hard, it was not that easy pushing the stroller through it. Regardless we finished. Besides the nice course, nice starting area and awesome t-shirts the best part of this race for me was the playground. The kids played and enjoyed the post-race snacks and I got a little time to rest and cool down. Did you run a race this weekend? Do you have tips for racing with kids in the stroller? I just had a flood of double stroller run memories come rushing back. Ah, memories. I have no tips other than to get out there and do it. The kids get bigger but it gets easier. Kind of… Great job!! I love pushing the kids and will definitely be sad when they no longer want to ride! It’s been a fun and interesting challenge whine I try and race with them. The spectators do make me feel like a rock star though!